THE INTRIGUE, acceptance and then fascination with offbeat musical creativity is a sequence of emotions which, in my book, remains enduringly satisfying – those awakening senses of discovery and abandonment exposing hitherto uncharted soundscapes. Oliver Weindling’s Babel Label (now in its 21st year) is the place to head for such revelations, the latest being this eponymous debut from electro-percussive quartet Woven Entity: Lascelle Gordon (percussion and electronics), Patrick Dawes (percussion), Paul May (drums) and Peter Marsh (bass), joined by guests Ben Cowen (keys, electronics), Julie Kjaer (alto sax, flute) and Alan Wilkinson (alto sax). Woven Entity’s four base quartet members have impressive individual CVs and, formed in 2010, this collaboration interlaces shifting, free-running textures, effects and grooves, all with a strong hypnotic attraction. The instrumental psychedelia becomes progressively immersive (especially when experienced loud) as the album proceeds with a phantasmagoria of electronics, percussion, mechanicals and field recordings, plus the introduction of atmospheric saxes and flute. This is not the jazz of comfortable melody and rhythm, hard- or post-bop, but rather an exploration into the unknown which initially feels mysterious – even challenging – but then, with its divergence, saturation and complexity of sound mix, arrives at ‘compelling’. Selecting some pointers from the ten tracks, the randomness of bass, drums, bongos and balafon in Naked Eye gradually transforms into a mesmeric riff illuminated by the brash, dry African mystery of Julie Kjaer’s flute; This Day Will Come suggests woodland clearings, Peter Marsh’s thrummed bass accompanied by echoic birdsong and childlike harmonica; and So Black Dada‘s vocalised jaw harp and multifarious percussive rattlings are joined by the hollow-yet-melodic alto sax of Alan Wilkinson. Trissh, an engaging ‘clockwork gamelan’, evolves into slow, deep trance peppered with electronics; and a cacophony of scribbles and scrawls announces ten-minute Earth/Crisis, a brooding, mobile bass riff over which Julie Kjaer’s alto fidgets and squawks almost involuntarily before heavy drumming builds in intensity, Kjaer’s electronically-manipulated sax becoming more shawm-like. Point Noir is bathed in esoteric mysticism, as if viewing safely from a distance, its brilliantly flutter-tongued flute over foreboding percussion and sustained, otherworldly electronics adding a sense of widescreen drama; and Moors & Orandas closes with its tantalisingly short burst of soundtrack, again featuring the propulsive bass of Marsh… a trailer for volume two, perhaps! Check out this absorbing release for yourself, available both as physical CD and download (with unlimited streaming) at Bandcamp. 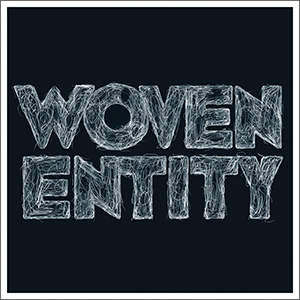 Woven Entity’s excitingly original sound feels particularly visual (maybe an oxymoron, but true) – no surprise, then, that their live London appearances have been so warmly received.